We have been sailing these waters since 2008 first as Sailandstay and now as Sailnplay, and more recently on our luxury catamaran, Optimist of London II, a Lagoon 380. We operate all-inclusive 4 hour cruises with a delicious meal, all drinks and watersports included. New for 2019 we are also operating a classic vintage wooden boat from 1957, the La Pinta del Este, on great-fun 2 hour trips around La Herradura Bay with a stop for a swim and snorkel in the lovely clear waters, with refreshments available on board. Or if it is pure, unadulterated luxury you crave, then join us on our 38ft high-powered Rodman cabin cruiser Charlie Ruggle for a 4 hour cruise around the gorgeous Costa Tropical with top cuisine, and all drinks and watersports included. We can accommodate individuals, couples, families, small groups or large parties on several yachts in a sailing flotilla, or onboard La Pinta del Este for up to 50 guests, with the option of terrific food and a free bar, perfect for your special event. Just call or email us with your requirements. You can relax & enjoy your day at sea with our fully qualified skippers and professional crew to look after you. Or, if you prefer, you can skipper your own boat. 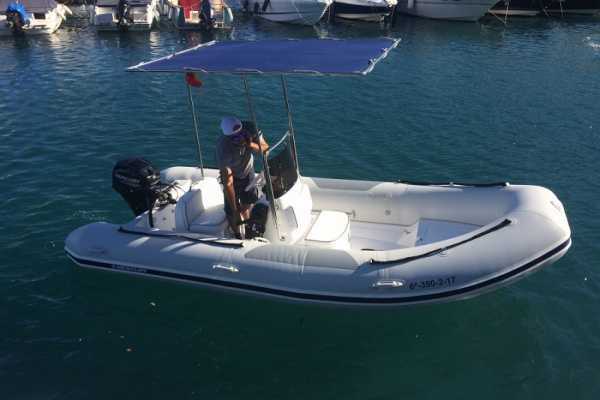 We have a wide selection of RIBs (rigid inflatable boats) and day cruisers available for self-drive hire for up to 12 people, and starting at just €170 for half a day. If you are in the area, pop into our brand new offices at the entrance to the marina, or have a good look around the website and either drop us an email or a call on +34 669118816 to discuss your requirements. We really look forward to welcoming back our old guests in 2019, and meeting many new ones! Our partner Paul has a luxury 17 seater minibus and can collect and deliver you to the marina ... please click Taxi for Paul´s contact details ... he also offers guided day excursions to all the major tourist attractions ... for further details, please click here for "Other Things To Do"
AVAILABLE from April 1st - October 31st SUMMER SEASON 2019 Adults: €20 Children 6-12: €15 Infants 0-5: €5 This is our most popular cruise. Great for those who are sailing with us for the first time. We provide everything onboard for your safety and comfort to make your two hours at sea a truly memorable experience. The only things you need to bring with you are swimming costumes, towels, hats, sunglasses, plenty of suncream, some spare cash for the onboard bar ... and a smile ! Choose from : 0930 - 1130 : Breakfast cruise 1200 - 1400 : Early lunchtime cruise 1430 - 1630 : Late lunchtime cruise 1700 - 1900 : Afternoon cruise 1930 - 2130 : Sunset cruise We operate a full pay cash bar onboard serving a selection of cold drinks as well as snacks and sandwiches. To check availability and reserve your seats on this two hour cruise, click here "Book Now!" and follow the booking instructions. Full payment will be taken at the time of booking. Please note: Our two hour cruises depart only when we have a minimum of 12 Adult Guests, please be flexible, particularly in low season, as we may have to consolidate trips together, and so departure times may vary. 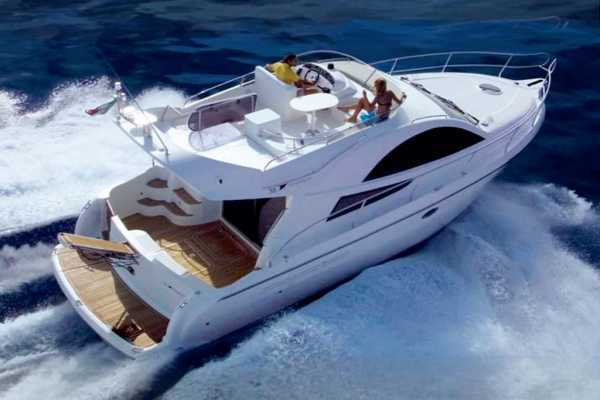 PRIVATE CHARTERS are also available. 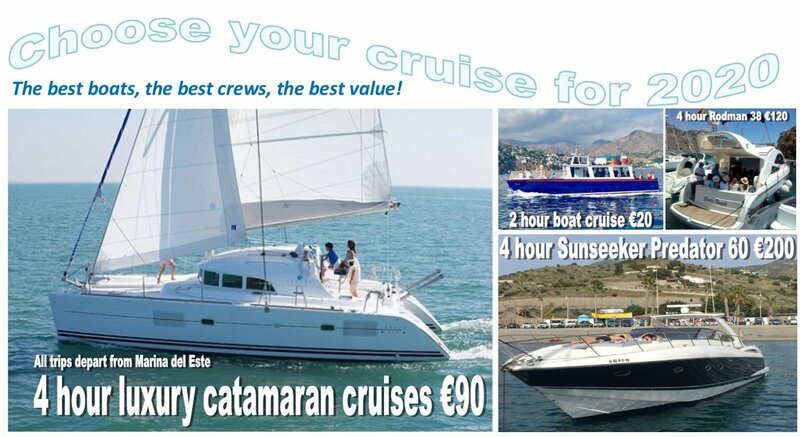 Charter the whole boat exclusivley just for you, family & friends. 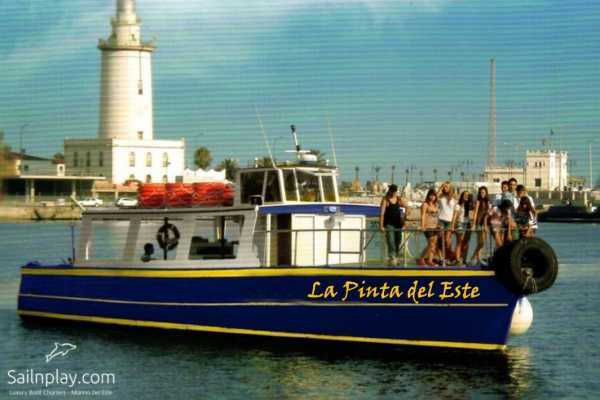 La Pinta del Este is fully licensed to carry up to 50 guests. Great for stag parties, hen parties, birthday parties, weddings, corporate events, in fact ANY large event or celebration! Please select from the drop down menu when making your booking. EVENT CATERING - We can cater for all PRIVATE CHARTERS, everything from Buns to Banquets, just let us know what your specific requirements are! Please refer to our Terms & Conditions. AVAILABLE from April 1st - October 31st SUMMER SEASON 2019 Adults: €100 Children 6-12: €50 Infants 0-5: €10 A unique 4 hour cruise on our super-luxurious 38ft Rodman features up to 2 different anchorages in sheltered bays for you to swim, snorkel, paddle board, or to simply chill out & relax. Welcomed onboard with a complimentary glass of cava and a fresh fruit platter, our skipper will give you a full safety briefing before we depart the marina. Cava, wines, soft drinks, beer, and even gin, whisky, vodka and rum (and mixers) are complimentary throughout your trip. We will also serve you a delicious buffet meal, either breakfast, lunch, or dinner, depending on the time of day. The sumptuous buffet will include fish, shellfish, meats, salads, cheeses, pizza, quiche, and plenty of other vegetarian choices, something for everybody! A half day at sea with everything onboard. Plenty of room to accommodate you & your party with wide, spacious decks, or the shaded canopy aft. Enjoy the spectacular scenery as we gently cruise the coastline. You may wish to take the helm and learn a little about sailing, under the supervision of your skipper. Please be advised we carry full safety equipment onboard, including lifejackets for all ages. Choose from : 9.00 - 1300 : Breakfast cruise with fresh juice, croissants, cereals, scrambled eggs, yoghurts, cheese and meat platter, coffee & tea 1330 - 1730 : Lunchtime cruise with lunch 1800 - 2200 : Sunset cruise with dinner The skipper and his mate prepare a delicious open buffet when we drop the anchor, which can be on your first or second stop. Complimentary champagne, wine, beer, soft drinks, spirits, mixers, bottled water and coffee/tea are served on all your cruises. To check availability and reserve your seats on this Half Day Charter cruise, click here "Book Now!" and follow the booking instructions. To make a reservation, you only need to pay a 25% deposit, and the balance is payable to your skipper at the end of your cruise ... but only when you are completely satisfied ... that is always our promise to all our guests ! Please note: Our Half Day Charter cruises depart only when we have a minimum of 6 Adult Guests. PRIVATE CHARTERS for up to 10 guests also available. Charter the whole boat exclusively for you, family & friends - please select from the drop down menu when making your booking. Please refer to our Terms & Conditions. Skipper your own RIB for half a day or a whole day for you and your family or friends. 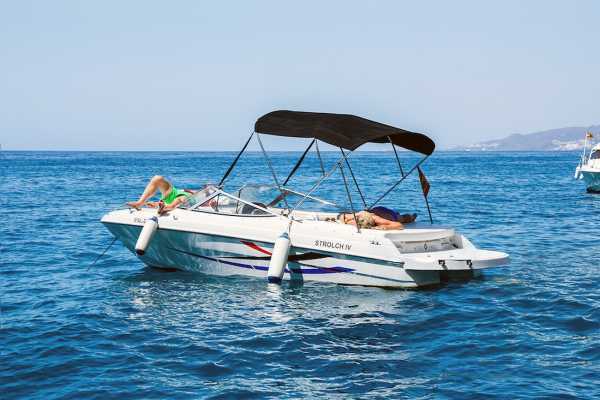 Rent your own boat for up to 7 people for half or a full day and explore the beautiful beaches, anchorages and coves of the stunning Costa Tropical. SELF DRIVE. No boat licence required, just photo ID and credit card for refundable deposit. As an optional extra we can provide you with catering and drinks if required for you and your party on your special day out, just contact us for further details when you have made your reservation. La Pinta del Este classic wooden passenger boat five 2 hour cruises daily at 0930,1200,1430,1700, and 1930 from €20 per person. Optimist of London luxury sailing catamaran three 4 hour cruises daily, at 0900, 1330, and 1800 from €80 per person. Charlie Ruggle 38ft Rodman luxury powered cabin cruiser three 4 hour cruises daily, at 0900, 1330, and 1800 from €100 per person. Selection of RIBs and day cruisers for self-drive hire (some require NO LICENCE) from only €170/250 half/full day. 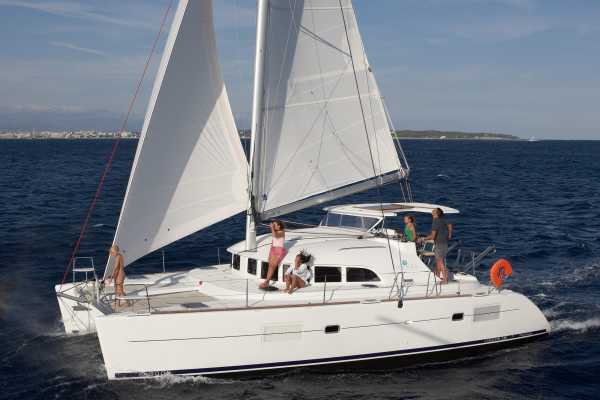 Optimist of London luxury sailing catamaran one 3 hour cruise daily at 1200 or 1300 from €60 per person. Other options are available, please ask for further details. Please book early, as we have to turn people away every summer. To make your reservation, please click here Book Now. You only need to pay a 25% deposit to secure a reservation, and the balance is payable to your skipper at the end of your cruise (La Pinta cruises are 100% payable in advance) ... but only when you are completely satisfied ... that is always our promise to all our guests !